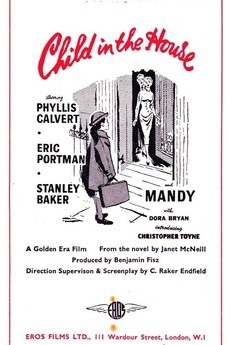 ‘Child in the House’ (1956) has a fine cast. The child star of the title is Mandy Miller, who so memorably played a deaf child in the film that shared her name. Meanwhile, she is supported by Stanley Baker, Eric Portman, Dora Bryan and Phyllis Calvert. There are also tiny roles for Alfie Bass and Joan Hickson. This roll call alone is enough to send me running to see this film. Young Elizabeth (Mandy) is sent to live with her aunt and uncle (Phyllis and Eric) when her mother is taken into hospital. Meanwhile, her father (Stanley) is on the run from the law for being a wrong ‘un where money is concerned. It’s all heart-wrenching stuff, only lightened by the presence of the huge-hearted maid (Dora). What I found most interesting about this film was Phyllis’ role as the aunt. The story opens with her going to collect Elizabeth from Victoria station and we are treated to an excruciating first meeting between the pair. It is obvious from the outset that the aunt has no experience of children and is quite nervous at the prospect of taking care of her niece. It is one of those scenes that is tense to watch and although you want to give her a bit of a talking-to, you can find sympathy for her at being thrust into this unexpected situation. They arrive home, and luckily for Elizabeth, it turns out that her uncle is a thoroughly nice chap who does know that you can carry on being yourself when a youngster is present, and not have to put on a tense smile the whole time. As the film progresses, you can see them build a rapport. But the aunt’s attitude to Elizabeth spirals downwards, as she is unable to understand the child and therefore handle her. She resorts to shouting and sanctioning. Finally, at a high point of tension, the uncle turns on the aunt, accusing her of marrying him for his prospects while secretly being in love with Elizabeth’s feckless father. It emerges that she has forced him to live in a “loveless home”. The implication here is that she cares only for status and refused to give her husband any children. She is a cold, hard-hearted cow. Just to round off the portrayal of a monster, she breaks the child’s beloved musical handbag. Clearly, Phyllis’ character is a monster simply because she has no children. Her state is unnatural and she deserves to be vilified. That is the message that I took from this film role. What’s worse, we are forced into feeling sympathy for the criminal father because he is a father and he loves his child. So that’s alright then; basically he is a sound human being even if he is a thief and confidence trickster. Unlike her, the barren-wombed harpie. What we are seeing here is a society that placed huge importance on parenthood. After World War Two, the government wanted women to desert the freedom of the workplace and become mothers, thus opening jobs up to returning servicemen and pushing up population numbers, decimated over two generations by bombs and guns. To not produce children meant that you were either a sad lost cause or a nasty piece of work. Because of this, the film gets away with this one-dimensioned portrayal of a woman. It is never explained why she remained childless, we are merely invited to condemn. Being a woman in the 1950s was really not all it’s cracked up to be. It is still an issue that has not been satisfactorily resolved.